12 • August 2018 • S I G N & D I G I T A L G R A P H I C S Drytac Floor Media Earns Class B1 Fire Rating Richmond, Virginia-based Drytac, an international manufacturer of adhesive-coated products and finish- ing equipment, announces that its trademarked SpotOn Floor 200 media has achieved a global Class B1 Fire Rating. This means Drytac's removable film for floor graphics can be used in public areas and other locations that must adhere to tight fire regulations. The material already possessed an anti-slip rating, the company says. SpotOn Floor 200 is an 8-mil printable PVC film with a Drytac-created removable adhesive. This adhesive has a unique dot-pattern that allows for easy, bubble-free application of graphics to most flat surfaces without the need for tools, according to the company. 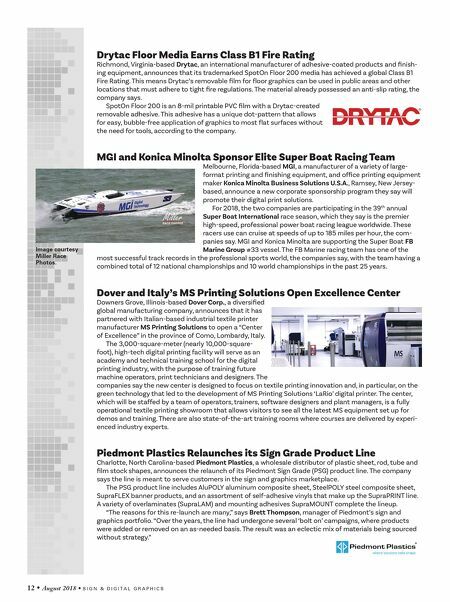 MGI and Konica Minolta Sponsor Elite Super Boat Racing Team Melbourne, Florida-based MGI, a manufacturer of a variety of large- format printing and finishing equipment, and office printing equipment maker Konica Minolta Business Solutions U.S.A., Ramsey, New Jersey- based, announce a new corporate sponsorship program they say will promote their digital print solutions. For 2018, the two companies are participating in the 39 th annual Super Boat International race season, which they say is the premier high-speed, professional power boat racing league worldwide. These racers use can cruise at speeds of up to 185 miles per hour, the com- panies say. MGI and Konica Minolta are supporting the Super Boat FB Marine Group #33 vessel. The FB Marine racing team has one of the most successful track records in the professional sports world, the companies say, with the team having a combined total of 12 national championships and 10 world championships in the past 25 years. Dover and Italy's MS Printing Solutions Open Excellence Center Downers Grove, Illinois-based Dover Corp., a diversified global manufacturing company, announces that it has partnered with Italian-based industrial textile printer manufacturer MS Printing Solutions to open a "Center of Excellence" in the province of Como, Lombardy, Italy. The 3,000-square-meter (nearly 10,000-square- foot), high-tech digital printing facility will serve as an academy and technical training school for the digital printing industry, with the purpose of training future machine operators, print technicians and designers. The companies say the new center is designed to focus on textile printing innovation and, in particular, on the green technology that led to the development of MS Printing Solutions 'LaRio' digital printer. The center, which will be staffed by a team of operators, trainers, software designers and plant managers, is a fully operational textile printing showroom that allows visitors to see all the latest MS equipment set up for demos and training. There are also state-of-the-art training rooms where courses are delivered by experi- enced industry experts. Piedmont Plastics Relaunches its Sign Grade Product Line Charlotte, North Carolina-based Piedmont Plastics, a wholesale distributor of plastic sheet, rod, tube and film stock shapes, announces the relaunch of its Piedmont Sign Grade (PSG) product line. The company says the line is meant to serve customers in the sign and graphics marketplace. The PSG product line includes AluPOLY aluminum composite sheet, SteelPOLY steel composite sheet, SupraFLEX banner products, and an assortment of self-adhesive vinyls that make up the SupraPRINT line. 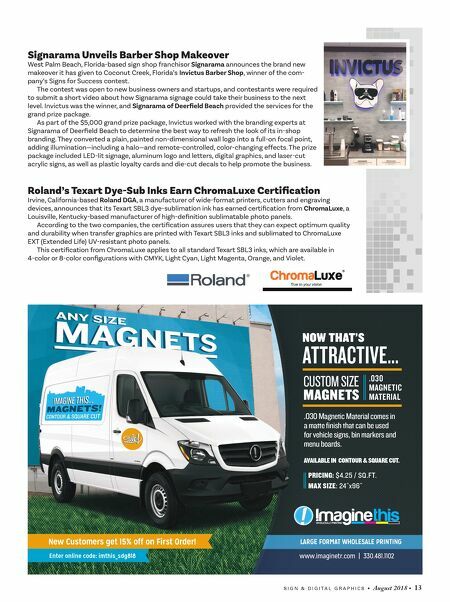 A variety of overlaminates (SupraLAM) and mounting adhesives SupraMOUNT complete the lineup. "The reasons for this re-launch are many," says Brett Thompson, manager of Piedmont's sign and graphics portfolio. "Over the years, the line had undergone several 'bolt on' campaigns, where products were added or removed on an as-needed basis. The result was an eclectic mix of materials being sourced without strategy." Image courtesy Miller Race Photos.